Kythis must be stopped! Bent on ascending to replace the slain god Samael, Kythis has begun gathering souls of fallen heroes to fuel his mad quest. It's up to you to marshal the forces of vigil's past and present to stop the demigod once and for all! Experience the strategy and tactics of a Deck Building Game by Magic: The Gathering Pro Tour Champions Justin Gary, Rob Dougherty, and Brian Kibler. Wield the power of the new Soul Gems to gain access to powerful heroes from the past. 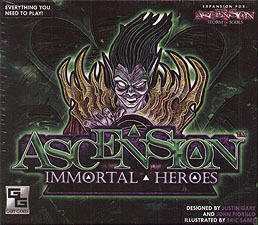 Playable as a stand-alone 2-player game, or combine it with Ascension: Storm of Souls for a expanded game that can be played with up to 6 players.